1924 Cookbook from Davie County Public Library Now Online at DigitalNC! 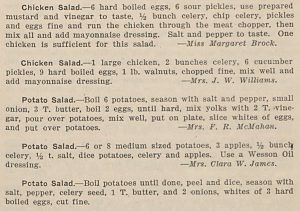 A 1924 cookbook from Farmington, North Carolina has been digitized and added to DigitalNC, courtesy of our partner, the Davie County Public Library. Compiled and published in 1924 by the Ladies Aid Society of Farmington, this cookbook includes recipes and “tested receipts” for a wide variety of dishes, including soups, seafood, meats and appropriate sauces, breads, salads, sandwiches, desserts, drinks, cakes, and more. Some of the recipes included in the photo on the right are for chicken salad and potato salad, as well as their appropriate seasonings. It also includes “miscellaneous” advice on how to prepare and preserve eggs and how to cure meat, as well as unusual home remedies for coughs (sulfur), burns (turpentine), and chapped hands (melted soap and bran). We can’t attest to whether these home remedies work or not! 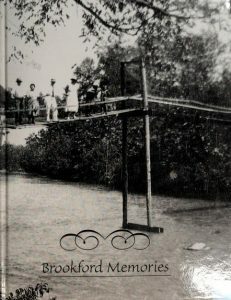 This cookbook represents a valuable new addition to our knowledge about Davie County in the early 20th century, as well as the knowledge women were passing around during the 1920s. To see more materials from Davie County Public Library, visit their contributor page or visit their website. We are excited to welcome new partner Robersonville Public Library to DigitalNC. With this addition, we are adding Robersonville and Martin County generally to our coverage map. Our first batch from Robersonville includes several yearbooks from Robersonville High School, as well as Abstracts of Deed Books, Robersonville Cemetery Records, and books on the history of Martin County. 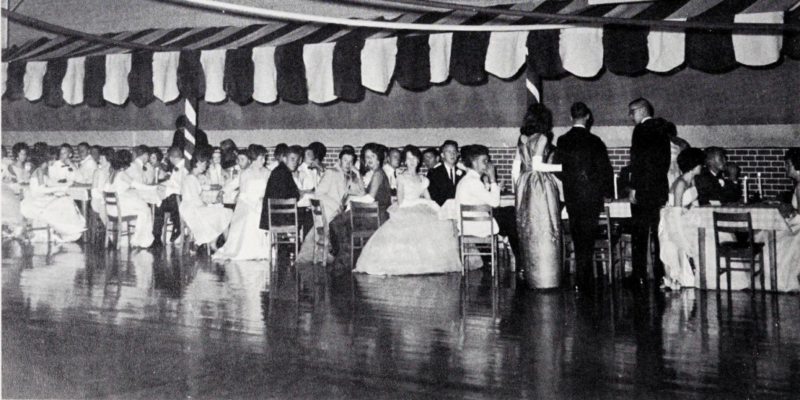 The high school yearbooks cover 1954 through 1967 for Robersonville High School and give a great glimpse into what life was like for students in Martin County at the time. Alumni who have moved out of the area will be particularly interested in these materials. The two books on the history of Martin County compiled by Martin County residents Francis M. Manning and W. H. Booker based on historical documents and oral histories. Martin County History Volume I chronicles more than two centuries of the county’s past, beginning with the arrival of colonists in the area that was previously only inhabited by native peoples. Martin County History Volume I explores notable events, individuals, and even inventions through 1976. 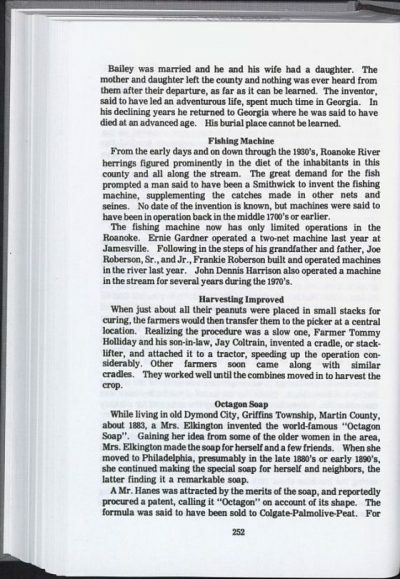 Some of the inventions discussed in Martin County History Volume I include octagon soap, and a filleting machine. Religion and Education in Martin County 1774-1974, also authored by these two local historians, includes information about Martin County churches, their congregants, their leadership, and even details regarding a nineteenth-century missionary movement within the county. 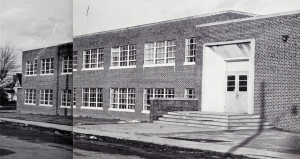 Part two of the book details the development of the county’s school system, including photographs and details of public and private schools alike. 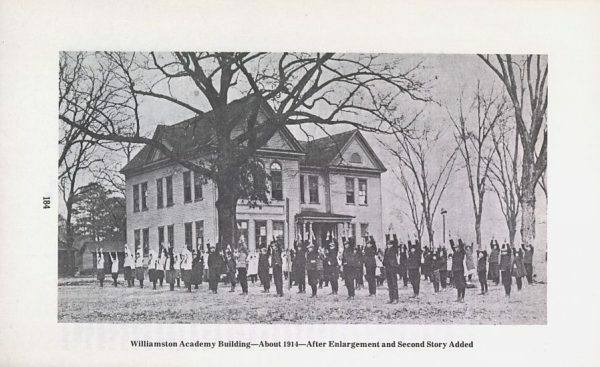 Students stretch outside of the Willamston Academy in Martin County in an image from Religion and Education in Martin County 1774-1974. Martin County genealogists may be especially interested in these new materials. Included in this collection are Abstracts of Deeds from 1774 to 1801, Will Books from 1774-1868, and two collections of cemetery records for Robersonville area cemeteries. These cemetery records including the new and old cemetery sections for the Robersonville Cemetery, the Grimes Cemetery, the First Christian Church Cemetery, and the Roberson Cemetery. These binders provide grave locations for many deceased residents as well as veterans status, dates of birth and death, and the names of plot purchasers for all included cemeteries. Robersonville Public Library is part of BHM Regional Library, serving Beaufort, Hyde, and Martin Counties. To see more from the Robersonville Public Library, visit their partner page here on DigitalNC or check out their website. A new batch of materials from our partner, Rockingham County Public Library, adds scrapbooks of news clippings, books and booklets about Rockingham County History, images, and more to DigitalNC. 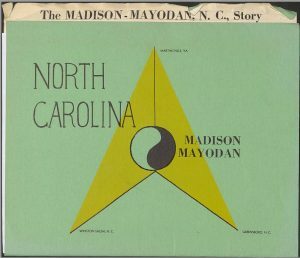 Included are two volumes collecting “Remember When” columns from The Madison Messenger, which recount historic events from the town’s past and the “Madison-Mayodan Story” which was a packet put out by the Chamber of Commerce to encourage investment in the community in 1960. It includes statistics about industry in the town, as well as some great photographs. The full batch can be seen at the links below. Learn more about Rockingham County Public Library by visiting their partner page or their website. Although Little’s focus is on Brookford, delving into family histories and specific childhood memories, the book touches on themes common to towns all around North Carolina and beyond. To see more materials from Hickory Public Library, take a look at their DigitalNC partner page, or view their website. Yesterday, on April 18, a new historical marker was unveiled in Pender County honoring the farming community of Van Eeden. 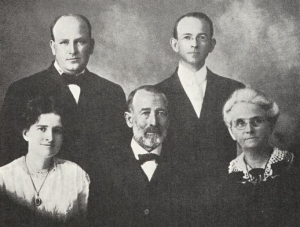 Van Eeden was located north of Burgaw and was owned by Hugh MacRae, who tried to start a farm colony with Dutch settlers there in the early 1900s that was named for Frederik Van Eeden, a Dutch psychiatrist and author, who helped MacRae recruit Dutch immigrants. We digitized a pamphlet that was put out in the Netherlands to promote the colony in 1913. The pamphlet is in Dutch and English. The colony was not very successful, but in the late 1930s, it fulfilled a new purpose. Alvin Johnson, the founder of the New School in New York, was working hard to bring as many Jewish refugees from Germany as possible, but was having difficulty working through the rules of the State Department. He found a loophole in the law though; there was no quota on those who came as farm workers. Working with MacRae, Johnson brought several Jewish families to Van Eeden to escape the Nazis. 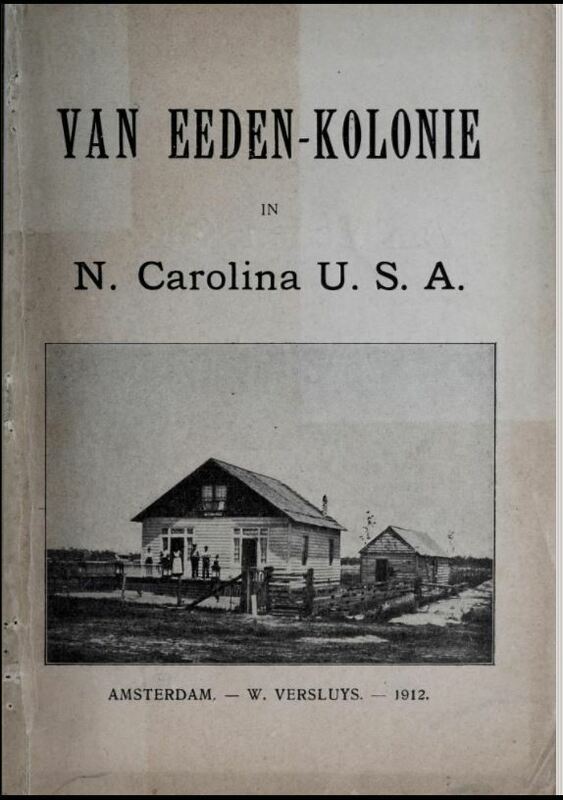 Susan Block wrote a book about the experience of those families who came from Germany and adjusting to life on a farm in eastern North Carolina titled Van Eeden, which we digitized as well. To learn more about our partner Pender County Public Library, visit their partner page. And to learn more about Van Eeden, visit the great libguide built by Pender County Public Library. The latest from the genealogy shelves of our partner institution Mauney Memorial Library can be found online at DigitalNC. In his book, White Plains Goes to War: The Civil War Saga of Edward and Benjamin F. Dixon, David C. Neisler chronicles the Civil War experiences of his ancestors, brothers Edward and Benjamin F. Dixon. The first half of the book focuses upon the lives and experiences of the Dixon brothers as Confederate soldiers in the Civil War. 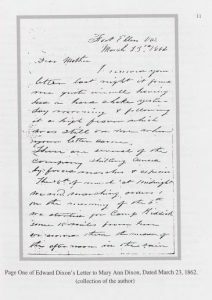 Neisler’s research is based upon personal correspondence and a few other documents found in a relative’s attic. 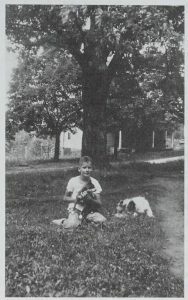 Copies of these materials and photos of the Dixon brothers are provided in the book. The second part of the book looks at Company D of the Fourteenth Regiment of the North Carolina Troops, or the Cleveland Blues as they were known. Lead by Edward Dixon, the Cleveland Blues were primarily from White Plains, N.C. Following a brief historical sketch about the Cleveland Blues, Neisler provides an annotated roster of all 68 volunteers who enlisted at the White Plains Post Office on April 26, 1861.